Bron Evans is a registered ATMS Kinesiologist with 14 years experience successfully working with babies, children, teenagers and adults. Bron consults in person from her clinic in Melbourne, or by phone / Skype to anywhere in the world. Holistic Kinesiology is a preventative, alternative medicine. It is a complementary alternative medicine therapy treating more than the symptoms or the disease. It recognises that the mind, body, spirit and lifestyle significantly affect the functioning of the physical body. Kinesiology evaluates and treats dis-ease in body, mind, and/or spirit by looking at preventative intervention and the treatment of the whole person. Been wondering how to change your life? In the 1960s, U.S. chiropractors combined Western Physiology techniques with ancient Chinese principles and Eastern wisdoms to formulate an alternative treatment which is the unique blend of Complementary Medicine now known as Applied Kinesiology and Kinesiology. Kinesiology is an alternative therapy that utilises a unique and effective process of muscle testing as a biofeedback to access the innate intelligence of you body-mind-spirit. This enables the Kinesiologist to access specific information from your cellular memory bank via the neurological system, acupuncture meridians, and energy template, and thus find the "stress" imbalances which may be resulting in dis-ease, or imbalance, within the system. Our subconscious brain holds all our memories from our physical, emotional, mental, and spiritual states, past and present, in all time and space. Some of these memories and states have a direct negative effect on neurological and physical function, and on muscles, which then leads to (chi) imbalances/blockages in the body. Using muscle testing, Kinesiology is wonderful in investigating, identifying and correcting these "stress" imbalances which ultimately interfere with the body-mind's innate sense of balance and self-healing.....enabling the body-mind-spirit to return to its natural state of homeostasis, health and well-being. Kinesiology facilitates the body in healing itself using its own innate wisdom to restore balance. By reading the energetic blueprint, Bron is able to locate and assess the source of individual patterns, heal the original wounding, clear the core beliefs and genetic lineage and integrate the life lesson, enabling you to create new effective ways of being and expanded consciousness. The soul counselling and kinesiology aspect of a Holistic Kinesiology session enables the client to receive insights and positive strategies for dealing with stress and life challenges almost immediately shifting the energy in the body and mind and leaving the client with new feelings of inner peace, empowerment and motivation. The new insights and conscious choices made on personal and spiritual levels enable energy to then be released to heal the physical and chakra systems and activate the DNA. Each of us holds the blueprint for optimum health & wellbeing, and this blueprint is the recipe for balance on all levels of being : physically, emotionally, mentally, biochemically, electrically and spiritually. To maintain this balanced and optimum state of well being and health in our day to day lives, our innate healing energy constantly tweaks and tunes our personal levels, in order to balance and upgrade us in accordance with our blueprint. This enable us to heal ourselves and function in liife to our greatest potential. While we all have this individual blueprint and healing ability, each of us manifests it in utterly unique ways. This requires a high level of personalisation of treatment. Want to change your life? Muscle testing is one of the tools the Kinesiologist uses to attain this high level of personalisation. The stresses and strains of normal day to day living in our fast-paced modern world can cause us to become unbalanced, moving us into a state of dis-ease within the body-mind-spirit. Whilst our innate healing energy is at all times doing its best to match our blueprint for ideal health, wellness and balance, sometimes assistance is required for our innate energy to restore itself to a state of homeostasis and equilibrium. Dis-ease in our system, if left unbalanced, can eventually manifest as a physical symptom in one form or another....from the common cold, to back pain, menstrual pain, depression, or cancer. Dis-ease is our soul calling us to look at how we are "doing" life, to relieve the stresses, re-create body balance, and to create a state of maximum "ease" - as opposed to "dis-ease". Holistic Kinesiology treatment provides the high level of personalisation required for each individual, and supports you, facilitates the process, and provides you with the tools necessary to change your life and create success, health and wellbeing on all levels. Holistic Kinesiology is suitable for all ages, from new borns through to the elderly. 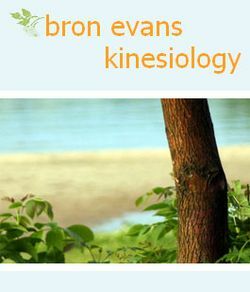 Using Kinesiology, Bron will facilitate you in identifying the stresses and imbalances specific to you, and will then utilise a diverse range of holistic disciplines to clear these blockages and restore your body's natural harmonious balance. In addition, she will assist you in gaining insights into subconscious awareness, aiming to empower you with new positive choices in lifestyle, self-image, and attitudes, and to facilitate your ability to live life passionately and to your greatest potential, creating a new way of living and being. As Kinesiology is extremely powerful on all levels, physically, emotionally, mentally, biochemically, electrically and spiritually, it is wonderfully effective in treating all ages and a diverse range of conditions, as well as facilitating life success, and personal and spiritual development. Bron is a registered ATMS Holistic Kinesiologist with 12 years experience working successfully with adults and kids of all ages. She initially completed a BA (Psych) and then a 2 year Diploma in Health Sciences (Hol Kin) from the College of Complementary Medicine with the award for academic excellence, ensuring thorough training in Kinesiology, Anatomy & Physiology, Nutrition, Flower Essences and Energetic Sciences. Bron continually expands her expertise with ongoing study and continual research in areas including quantum medicine, evolution, Sacred Kinesiology, Kabbalah/Tree of Life healing, Egyptian mystery school teachings, sacred geometry, bioenergetics, medical astrology, metatronic healing and vibrational remedies, weaving her training and and the findings of her research with her wisdom to assist her clients in quickly changing their lives by altering out-of-date systems that limit the human experience. Bron Is also an advanced practitioner in Neural Organisation Technique (N.O.T. ), working with your body's structure and function by reprogramming the basic neurology and survival mechanisms of feeding, fight/flight, reproduction and immunity. N.O.T. provides profound and life-changing results. Bron is also an advanced practitioner in Neural Organisation Technique (N.O.T.) working with the body's structure and function by reprogramming the basic neurology and survival mechanisms of feeding, fight-flight, reproduction and immunity. N.O.T. creates profound and life-changing results. She combines N.O.T. with training in the primitive and postural reflexes, and movement & learning, to specialise in working with kids (& adults) particularly in the areas of learning, behavioural & social difficulties, ADD, ADHD, dyslexia, allergies, digestion, hormonal problems, postural and co-ordination problems, and back/neck pain and sciatica. Bron is also a qualified Transitional Therapist, offering a personal and spiritual development programme conducted on a sessional basis over 6 months. Please enquire for details of the programme. Bron combines all this with Counselling Kinesiology to offer you a professional, compassionate, fun approach to your journey of self-awareness and healing, to bring about vibrant health and and wellbeing, accelerating their awakened consciousness. Clients regularly experience deep releases along with an abundance of life force, whilst also releasing limiting and outdated programs and energy patterns, fears, and belief systems that have long blocked their well-being, growth and self-realization. 'Bron, this has truly been the most powerful and positive influence in my life. You have helped me align to my true soul purpose! Thankyou. You have taught me ways to expand my vision and energy to higher levels of consciousness and have have helped me release old patterns, habits, addictions and fears, cleared karmic patterns and emotional blockages, and helped me to understand true mind/body/spirit connection"
Not based in Melbourne, or unable to make to the clinic? Benefit from the powerful insights, shifts and quantum energetic healing power of kinesiology without having to travel to a clinic. One hour distance sessions are available via phone/Skype, with the effectiveness of a face to face consultation. A personalised take-home Flower Essence Blend is included in the treatment to facilitate and enhance the treatment results. Kinesiology is carried out fully-clothed on a massage table.